About 120,000 motorcycle riders nationwide joined forces to hit the newly signed double plate law, which they tagged as anti-poor. Dubbed as the biggest Unity Ride ever, biker groups showed their outrage against the Republic Act 11235 or the Motorcycle Crime Prevention Act of 2017, authored by Sen. Richard Gordon and Senate Majority Leader Vicente Sotto III. Last week, it was signed into law by President Rodrigo Duterte. The law eyes to address the rising number of crimes committed by motorcycle-riding gunmen. Hence, the law mandates the Land Transportation Office (LTO) to issue bigger license plates that must be placed in both front and rear parts of the motorcycles. Moreover, plate numbers must be big enough to be readable even from 12 to 15 meters away. Meanwhile, riders believed that it isn’t safe for them. They explained that the front-mounted plate may become detached due to several factors such as vibration, and wind. With this, it might cause a bigger risk to both the rider and the pillion, as well as to pedestrians and other road users. In addition, the riders claimed that there were no proper consultations from experts and motorcycle riders to know if installing bigger plates on both front and back is safe – or if it is even applicable to all types of motorcycles. “Old and new motorcycles don't have the provisions for a front-mounted plate. Adding a bracket outside of factory specifications will surely pose a big risk for the riders, their passenger, and even the pedestrians,” Jobert Bolaños of the Motorcycle Rights Organization (MRO), addressed. "And not all motorcycles have the same front design that can accommodate stickers or decals which takes away uniformity. And without uniformity, there is subjectivity," Bolaños added. "Safety is of paramount importance to Angkas. 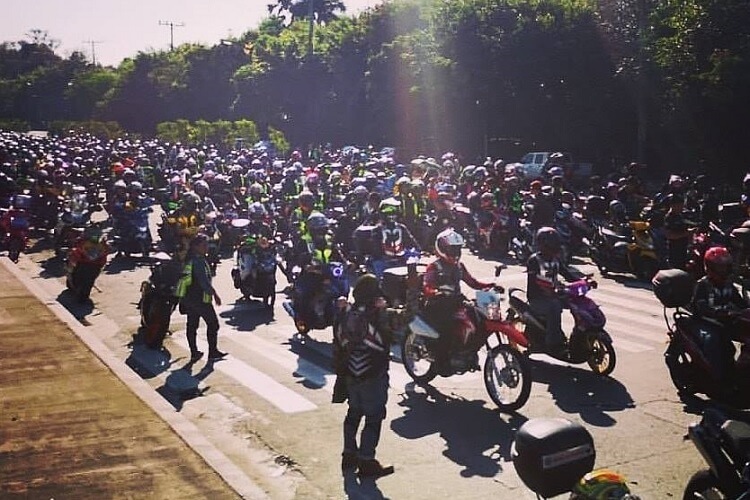 That is why we do not agree with the provision requiring the installing of big metal plates at the front of motorcycles,” Angkas Head of Regulatory and Public Affairs George Royeca, whose Angkas rider-partners came in the thousands to join the Unity Ride, said. To conclude, the riders explained that motorcycle-riding criminals would still be able to commit crimes by simply taking off the license plate, as the criminals have always been doing.